Following the jury photocall, Kristen Stewart was all smiles as she walked on stage this evening(May 8th) during the opening ceremony and 'Everybody Knows' premiere during the 71st Cannes Film Festival in Cannes, France. 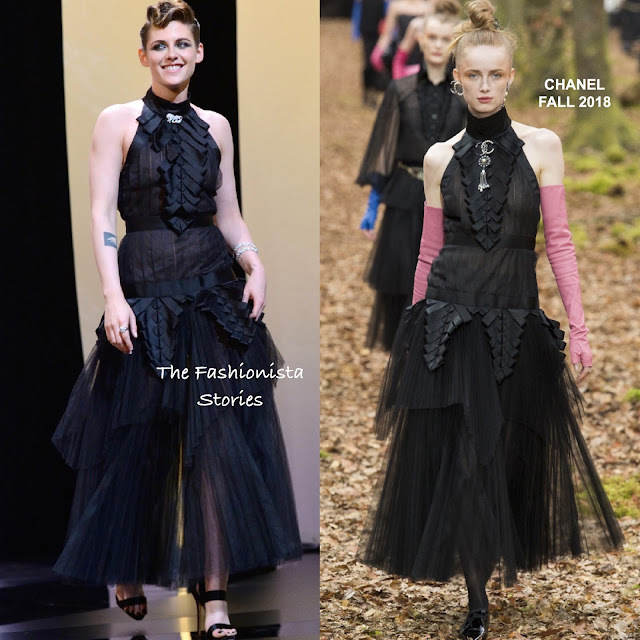 She stepped out in a CHANEL FALL 2018 black pleated tulle halter dress with an statement brook on the neckline and a tier skirt. Kristen is a loyal brand ambassador so we will probably see her in the brand for the most part during Cannes. When it comes to her beauty look, Kristen almost always gives up something on the edgy side and this was no different. Check out a close-up shot of her chic hairstyle via her stylist instagram. She topped off her look with FOUNDRAE jewelry and GIUSEPPE ZANOTTI sandals.